In this file photo taken on May 22, 2018 a rare Imperial Qianlong porcelain vase (18th century) is displayed at Sotheby's auction company in Paris. An 18th-century Chinese vase forgotten for decades in a shoe box in a French attic has been sold for 16.2 million euros ($19 million) at Sotheby's in Paris on June 12, 2018 -- more than 30 times the estimate. Thomas SAMSON / AFP. 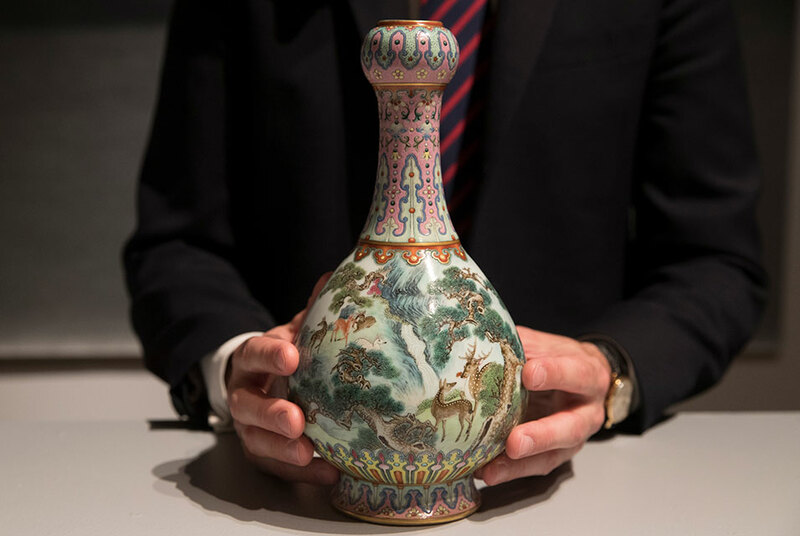 PARIS (AFP).- An 18th-century Chinese vase forgotten for decades in a shoe box in a French attic sold for 16.2 million euros ($19 million) at Sotheby's in Paris on Tuesday -- more than 30 times the estimate. Experts at the auction house said the exquisite porcelain vessel was made for the Qing dynasty Emperor Qianlong and had set a guide price of a much more modest 500,000 euros. "This is a major work of art, it is as if we had just discovered a Caravaggio," Olivier Valmier, the Asian arts expert at the auction house, told reporters before the sale. The vase, which was in perfect condition, "is the only known example in the world bearing such detail," he added. Rare porcelain from the Qian period has been going for astronomical prices recently. A bowl made for Qianlong's grandfather sold last April by Sotheby's in Hong Kong went for $30.4 million dollars. The vase -- which is decorated with idealised images of deer and cranes from the imperial summer hunting grounds at Mulan in northern China -- was found by chance among dozens of other pieces of Chinoiserie in the attic of a house in France earlier this year. The family -- from near Paris -- had acquired it at the end of the 19th century but it lay unloved in a shoe box in the attic for decades. "We didn't like the vase too much, and my grandparents didn't like it either," said the owner of the piece, who only got in touch with Sotheby's in March. It was still in the shoe box when it was presented to Sotheby's experts for authentification. The staggering price paid by a young Chinese collector, who was at the auction himself, is the highest ever recorded by the auction house in Paris. The man, who was wearing a jogging top, beat off bids from other Chinese collectors, mostly over the phone. The collector, who has has not been named, also did the bidding himself -- a rarity at this level of auction. The polychrome vase with its idyllic landscape of mist-topped mountains and pine trees also carries a six-character "reign mark" on its base. The only other "yancai ruyi" vase that has so far come to light is in the Guimet museum of Asiatic arts in Paris, though it does not have the cranes. Only four similar pieces have been documented as coming from the imperial workshops in Jingdezhen, the southern Chinese city known as the "Porcelain Capital". In 1765 a pair were made for the Buddha pavilions in the Emperor Qianlong's private apartments. Four year later, two more were ordered as a present for his birthday. The Qing dynasty, China's last imperial family, reached its apogee under Qianlong and originally came from Manchuria, the region depicted on the vase. "Such elaborate and challenging designs are exceedingly rare on Qing imperial porcelain," said Sotheby's. Experts believe that the vase was bought in France because it was found with a Japanese parfume burner which still had its receipt from the Exposition Universelle world fair in Paris in 1867. The animals and plants on the vase are all highly symbolic. The deer is a marker of happiness and prosperity, cranes represent age, the pines eternal life, and the lingzhi mushroom immortality. However, the Qing masterpieces also show much Western influence with their makers having taken on methods and colours -- particularly the pinks -- learned from the Dutch and from Jesuit missionaries. An imperial stamp used by Qianlong set a new world record when in was sold for 21 millions euros in Paris in 2016. EYE Filmmuseum has a new employee. And it's a robot!